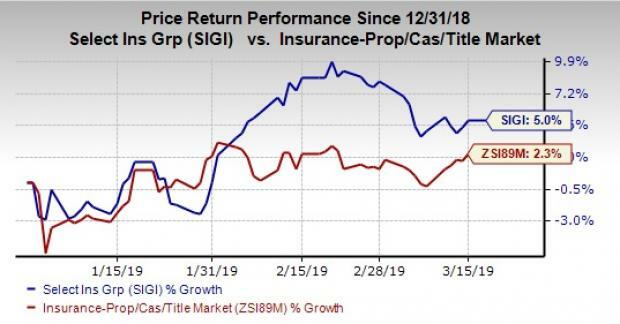 Selective Insurance Group, Inc. SIGI is poised for long-term growth on the back of geographic expansion, improving premiums, enhanced rate environment and solid capital position. It has an impressive Growth Score of A, which reflects solid growth prospects. Its long-term earnings growth rate is pegged at 12.7%, better than the industry average of 9.7%. Selective Insurance’s return on equity — a profitability measure — is 12.7%, better than the industry average of 7.1%. This reflects the company’s efficiency in utilizing shareholders’ funds. Shares of this Zacks Rank #3 (Hold) have moved up 5% year to date against the industry’s 2.3% increase. The stock carries an impressive VGM Score of A. This helps to identify stocks with the most attractive value, growth and momentum. Geographical expansion has been an effective option for growth. Selective Insurance now has total commercial line presence in 27 states. Also, as part of the long-term growth strategy, the company intends to increase standard commercial lines market held by its Ivy League distribution partners to at least 25% as well as grow its share of the business within these distribution partners. Substantial new business opportunities and high retention ratio as well as pure renewal price increases should continue to drive premiums, which in turn fuels the top line. Selective Insurance has been strengthening its balance sheet. Debt-to-capital ratio was effectively lowered by 540 basis points over the last five years. The company targets leverage ratio of about 25% over the long term. Also, the company increased its dividend at a five-year CAGR (2014-2018) of nearly 9%. Dividend yield of 1.3% was better than the industry average of 0.5%, making it an attractive pick for yield-seeking investors. Over the past 60 days, the stock has seen the Zacks Consensus Estimate for current-year earnings move 1.7% north and increase 9.3% for 2020. The Zacks Consensus Estimate for 2019 earnings is pegged at $4.20, indicating 14.8% year-over-year increase on 7.5% revenue growth. For 2020, earnings estimates are pegged at $4.48, reflecting 6.6% year-over-year increase on 5.2% revenue growth. The company outperformed earnings expectations in the last six quarters, reflecting operational excellence. 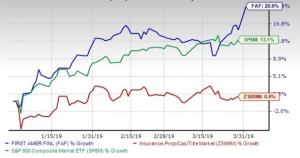 Some better-ranked stocks from the insurance space are Berkshire Hathaway Inc. BRK.B, MGIC Investment Corporation MTG and Arch Capital Ltd. ACGL. Berkshire Hathaway engages in insurance, freight rail transportation and utility businesses. It came up with a 4.04% beat in the last reported quarter. It currently sports Zacks Rank #1 (Strong Buy). You can see https://www.zacks.com/stocks/buy-list/?ADID=zp_1link&ICI... _1link">the complete list of today’s Zacks #1 Rank stocks here. MGIC Investment provides private mortgage insurance and ancillary services to lenders and government sponsored entities in the United States. The company delivered a 33.33% positive surprise in the last reported quarter. The stock presently carries a Zacks Rank #2 (Buy). Arch Capital provides property, casualty, and mortgage insurance and reinsurance products worldwide. It came up with a 24.32% beat in the last reported quarter. It presently carries Zacks Rank #2.